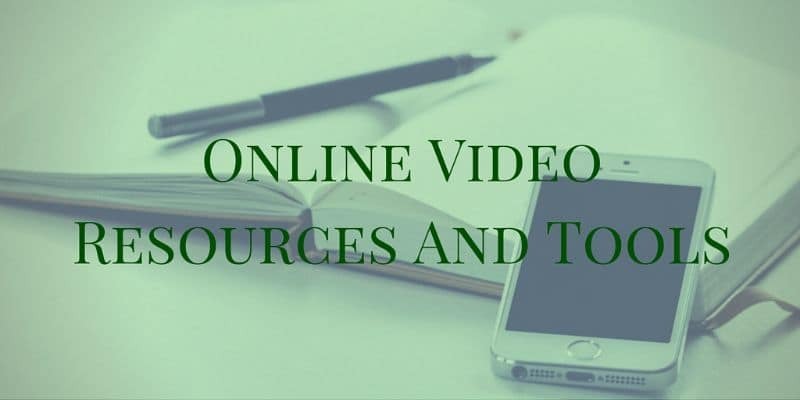 I often get asked about resources I use for online video so here is a summary of some of the tools I use for online video and live streaming. These will be of assistance especially if you have a limited budget or want to take a DIY approach to creating video for your business that you can use in your sales page, include in emails, send customised messages to prospects and clients, use for customer support and for employee engagement. 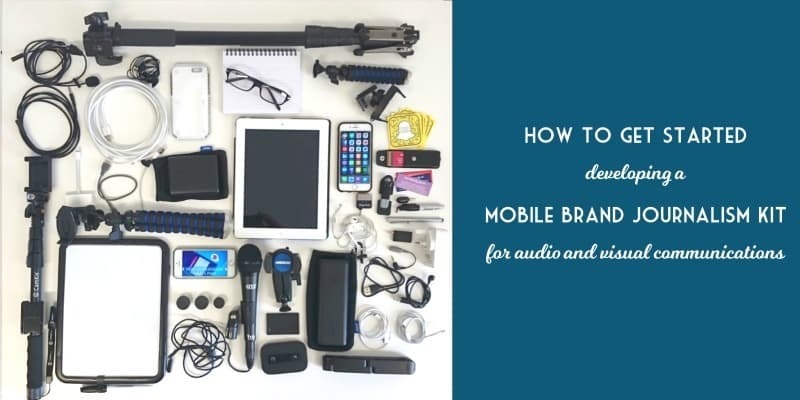 I have documented three levels of brand journalism kits (starter to pro) in this article and below you will find more resources that I use and recommend. I use video content for communicating with my clients, for example when giving feedback on their social media marketing – this video I host privately using Amazon S3 sometimes in combination with my membership community or with YouTube. If you have a PC and are just getting started with video creation then two free tools you can use to create video are Audacity to record audio and Windows Movie Maker to create a video from slides, images and your audio – it also enables you to edit video. On the Mac then you have iMovie and don’t forget this is also available for your iPhone and iPad. I use iMovie for quick video edits of live streams if I do not want to do a full video edit on desktop. I use Camtasia by Techsmith for editing video content for our client work and most of my online video tutorials and live stream replays – it is available for Mac and PC. If you want to create professional looking videos from images and audio including being able to access royalty free music so that you do not breach copyright then I recommend the business version of Animoto or Wave.video. You can use animated gifs not just for entertainment but also for education – there are lots of gif tools available for mobile. On desktop Ezgif.com is simple online GIF maker and toolset for basic animated GIF editing including being able to create, crop, reverse, optimise and add effects. If you want to take your gif creation to the next level creating beautiful designs then I highly recommend using Easil. If I have limited time to edit video and am doing so on my iPhone, I will usually use Adobe Spark Post, WordSwag and Phonto to create and edit an image for example for a video thumbnail and Skitch to edit screen capture content for video tutorials I make for Twitter, Instagram, and Facebook. I have been hosting webinars and teleseminars for over 10 years and over that time I have tried and tested many tools, but I personally like to use GoToWebinar as a platform when working with corporate clients as I can host up to 1000 attendees in a private platform. For my virtual mentoring programme I usually use GoToMeeting as it is an easy platform to use where we can screen share our content I have invested in Easy Webinar and Webinar Jam as optin-wrappers when using Google Hangouts On Air – but typically I go back to my preferred platform of GoToWebinar. A relative newcomer with great conversation tools and analytics for live video is Crowdcast – this is a platform I used as the producer for a cooking show with an Australian chef. I have from time to time needed to deliver content in a webinar of my mobile phone screen – my favourite tool for this when hosting a webinar is to use Zoom.us – I can share my mobile phone screen using this platform and attendees can join by smartphone or desktop. An alternative would be to use a regular webinar platform and use a multi screen sharing tool such as ManyCam. If you are serious about your production of content on live video and want to include additional assets then you will want to check out VMix and Wirecast for live streaming. If you are a Mac user then I highly recommend ECamm Live. Optimise your YouTube channel using TubeBuddy – this speeds up your workflow for your live stream replays. Learn how to caption your replays on Facebook and YouTube using captions – resources are in this article. Subscribe to my Live Stream Insiders shows for free advice and guidance on live streaming provided by myself and my co-host, broadcaster and author Peter Stewart – you will find details of the forthcoming episodes and how to follow us on social media channels at the Live Stream Insiders show. I use a MXL MM160 lavalier microphone for my live streams when using my phone – if you do not have a lavalier then I recommend using the headset and mic that comes with your smart phone. I particularly like this mic as it is robust for when traveling as it is always in and out of my bag and it has a long lead so I can be away from the phone when recording. An alternative slightly more expensive lavalier is the Rode Smartlav Plus for mobile broadcasting. I have this too as a second mic for recording interviews. When recording videos on my mobile device in the office I use a small tripod from Arkon which allows me to film in portrait and landscape (I have a slightly different edition to the current 7.5″ tripod as you can see in the photo above and I also use the new 11″ tripod which has a spirit level with it). Arkon have a wide range of products for videography and smartphone photography as you will find here on their website or you will find some of their products on Amazon. To stabilise your mobile phone when walking and filming, you may want to invest in a stabiliser. I use a number of different tools for this – one that is very small and portable is the GRIPT, a tripod adapter and handgrip for your smartphone. Check it out on their website here. Another tool I have purchased is the iOgrapher film making case and lenses – they have a range that is specific for your iPhone or iPad – find their website here and you can attach other devices such as a shotgun mic or a light and attach the frame to a tripod or monopod. The one challenge is that their products are device specific. A product I have recently invested in as a Kickstarter product is the Padcaster Verse which will hold your Android or iOS device up to the size of an iPad mini and allows you add external kit such as a teleprompter, lights or microphones – learn more about the options available here. If you are looking for a professional stabiliser, my favourite product that my co-host for Live Stream Insiders uses is the Lanparte HHG01 3-Axis Handheld Gimbal Stabilizer for your smartphone – though it is hefty investment if brand journalism and mobile journalism is new to you. You can find it on Amazon in the US and the UK. It is certainly on my wishlist for a future purchase. If you want a remote to record video and photos on your smartphone then I recommend the HISY Camera Remote for Apple & Android – you can find it on their website or in an Apple store online. One of the challenges for mobile brand journalism and live video is the requirements for battery power – my favourite battery pack that I can use to fast charge two devices such as a phone and mobile broadband is the Anker PowerCore 20100 Ultra High Capacity Power Bank – I also have a smaller version. If you are looking for a portable green screen that you can use in the office or take to events check out the Elgato Green Screen – it comes in a portable case and pulls up like a pop-up banner.